Hope, fear, the economic crisis, skepticism, are just some of the sentiments expressed in our press. 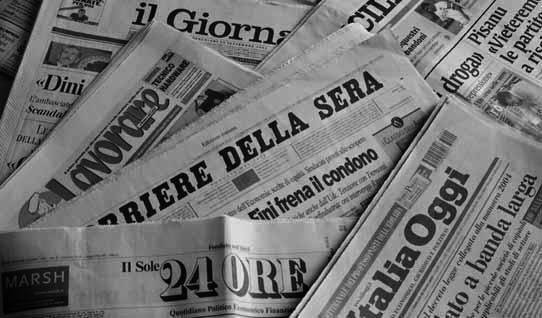 La Repubblica headlined with “The Hour of Responsibility” and dedicated nine pages to the event. An entire page was devoted to the first lady’s outfit and to her strong character. On that same topic Jamaican writer Zadie Smith remarked that if Michelle Obama “had been a white woman no one would have criticized her attitude”. In Vittorio Zucconi and Alexander Stille’s comments certain novelties that Obama will bring were underlined: first of all, the farewell to “the Bush ideology” and a different approach to foreign policy. Then, an analysis of Obama’s language, full of symbols, even religious ones, and references to God, Lincoln and Martin Luther King. It is impossible not to note that Obama’s Inauguration, an amazing real-time TV show, was followed from every part of the world. Every part of the world BUT Italy. In fact two of the three official national channels, Raiuno and Raidue, did all but snub the ceremony. By law every Italian watching these channels has to pay a tax to receive their broadcasts. This should mean that all main events, especially those connected to the news and to important contemporary facts, merit full coverage and should be considered a priority. Additionally, the three free TV channels belonging to Mr. Berlusconi also decided not to show the ceremony live. The reason for such an omission is a mystery. Only a few minutes were de dicated to the President’s oath on Canale 5, one of the premier’s networks, then shortly afterward, supposed audience favorites such as Big Brother, Who Wants to be a Millionaire, and local crime news returned to the airwaves—evidently they are a priority compared with the Inauguration of the first African-American President in the history of the United States. This attitude is rather inexplicable when other moments like, for instance, the press conferences of Premier Silvio Berlusconi, are given considerable space—and sometimes are even shown twice, at different times, to give another chance to those who had the misfortune of missing them the first time. The pay-tv channels such as Sky and other cable channels were connected to Washington with complete coverage. What a pity that not at all Italians could enjoy this privilege, especially those who pay for a yearly subscription to the national channels! The most cynical pundits observed that Mr. Silvio Berlusconi, lacking his own opportunity to take a televised oath, decided to ignore what was happening on the other side of the ocean, since he retains control of the national channels and his privately-owned stations. Could it be true? Indeed, when a journalist asked the Italian premier why he wouldn’t go to Washington for the Inauguration, he replied that he is a “protagonist, not an extra”! Italian opinion of Obama is mainly positive. I asked students, common people and relatives, and all expressed feelings of hope and faith in the capabilities of the new president. I was very surprised, for example, to hear Giovanna, 52, an elementary school teacher, declare that Obama is her president, that she “looks to him because the situation in Italy is incredibly depressing”. Giulio, 18, a student, told me that he envies the Americans “because they had the courage to change, to give power to a young man who had spent relatively little time in political office, and furthermore…is black!” Elsa, 90, a retired postal worker, is literally in love with Barack Obama, she “would marry him” and is so sure that “he will solve all problems with patience and capability”. This Obama-mania has endured for months, increasing and winning over more fans day after day. Here in Italy there is a sense of weariness because of the political class’ apparent inability to renew itself. Unfortunately, at least for now, it seems almost impossible that a miraculous Italian Obama will arrive on the political scene and finally lift our country to a mature and developed democracy.